I’ve always wondered what it would be like to write with a spouse. Jim and Joyce LaVene fill us in. 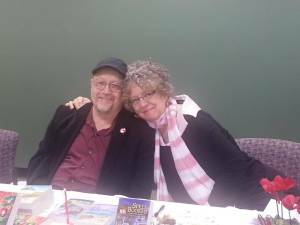 The Cozy Cat Chronicles would like to welcome our guest authors Jim and Joyce LaVene. Taken from Jim and Joyce LaVene’s Amazon Author Page: Joyce and Jim Lavene write award-winning, bestselling mystery and urban fantasy fiction as themselves, J.J. Cook, and Ellie Grant. Their first mystery novel, Last Dance, won the Master’s Choice Award for best first mystery novel in 1999. Their romance, Flowers in the Night, was nominated for the Frankfurt Book Award in 2000. They have written and published more than 70 novels for Harlequin, Penguin, Amazon, and Simon and Schuster that are sold worldwide. They have also published hundreds of non-fiction articles for national and regional publications. They live in Midland, North Carolina with their family and their rescue pets–Rudi, Stan Lee, and Quincy. Welcome! Jim and Joyce. We are very happy to have you here. Who Wears The Pants on Tuesday? Previous Church? Sports? Priorities Have Changed.